Link to almost anything related to specific spot? 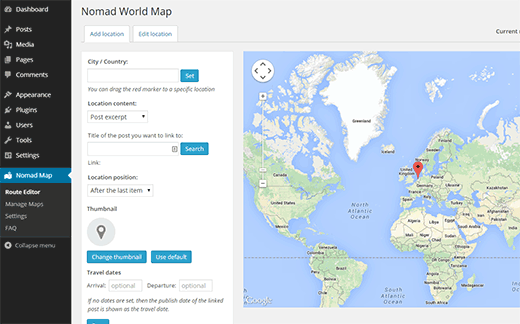 Nomad World Map is a plugin that lets you go beyond simpler map hacks to do all that in style. An image of the Nomad World Map Plugin default map editing screen after installation. From WPBeginner on June 13th, 2015. A typical way all the features might be put to use would be to plan the route of an upcoming trip. Then, as content is written about these locations, they can be either edited to be associated with posts rather than just dates, and new locations with posts can be added. No time for a full post? No problem! Simply associate a picture via the “Thumbnail” option, or associate a link (to a museum website or event page for example). Travel can go from “content gap” to content cornucopia! Two difficulties with the Nomad World Map plugin are clunky post title search and lack of location specificity. 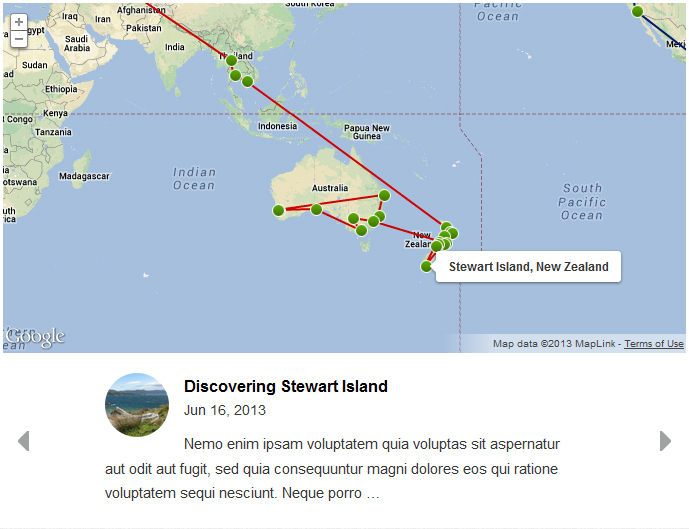 In order to associate a post with the map pin, the search field requires the full cut-and-paste post title. Unless your memory is exceptionally strong, this requires opening your Admin Screen in another tab and navigating to All Posts. A better solution would use a real time word filter, but search should at least accommodate providing results based on tags or part of a title. Secondly, you can only pin city and state locations. This was unfortunate as one could easily envision using such an plugin for trips around town, for posts about local activities (parks or restaurants for instance). It is after all called “World Map”, but it was the one major feature sorely missing.